Clinical grade zirconia has been used throughout the dental industry for over a decade, but the interest level has accelerated recently due to its versatility as well as the ever increasing cost of noble alloys, especially gold. Yttria tetragonal zirconia polycrystal (Y-TZP) material, a zirconia oxide, is the standard form of zirconia that is currently utilized. Y-TZP is a monophasic material formed by sintering crystals directly together without interference. This allows the material to keep its inherent properties and stabilizes the overall structure. All zirconia materials are not innately equal, as there may be differences in the overall flexural strength and cosmetic capabilities. When prescribing zirconia restorations, a solid understanding of the specific benefits and potential drawbacks is vital. Zirconia restorations are available in two distinct versions: 100% monolithic or a zirconia coping with a porcelain overlay. Layered zirconia restorations combine both the highest esthetics and the strength and flexibility you need for all posterior and anterior cases. The zirconia substructure typically has a flexural strength of 1200 MPa, comparing favorably to traditional porcelain fused to metal crowns. Additionally, extensive laboratory testing has shown the fracture toughness and flexural strength of zirconia are significantly higher than that of alumina or any other all-ceramic materials. With layered zirconia there is no metal to show through and no unsightly black lines at the gingival margins. 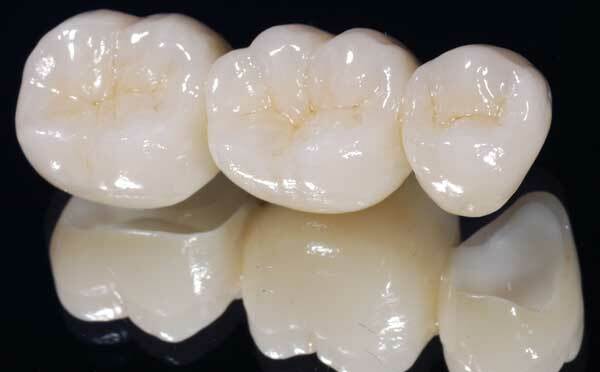 Layered zirconia crowns and bridges are cemented conventionally with resin ionomers cement and demonstrate outstanding biocompatibility in the mouth. They can easily be adjusted chair-side with a green stone or a diamond bur. If you need a crown that requires minimal clearance or a crown to stand up to a severe bruxer, then a solid zirconia restoration is a viable alternative for posterior crowns and bridges. Designed and milled using CAD/CAM technology, solid zirconia restorations are sintered for over six hours at 1,500 °C. Solid zirconia does not have the same level of esthetics as the layered version, but what is lacks in esthetics, it makes up in sheer strength. Fabricated out of 100% monolithic medical-grade zirconia, it is virtually unbreakable. Even patients with the most severe form of bruxism will not have fracturing issues. A solid zirconia restoration should be properly glazed and highly polished to avoid grinding and wear down on opposing teeth. This smooth surface will also lead to a reduction in plaque accumulation inside the patient's mouth. If you would like to have more information about layered zirconia and solid zirconia, feel free to download our white paper on this topic - find the link below.